We were staying at the Midway Campground in the Big Cypress National Preserve, and today we drove the 17 miles east on U.S. 41 to the Shark Valley unit of the Everglades National Park. Many folks have told us a visit there is a "must". Actually, we had visited before on March 6, 2006, but we only got a small taste. Back then, we didn't have bikes and we didn't take the tram tour either. And looking back at the photos, we had some nice ones, but they weren't as good as some of the ones we got today. Shark Valley is named for the Shark River Slough, and the fact that it is a couple feet of elevation below the surrounding land makes it a "valley". 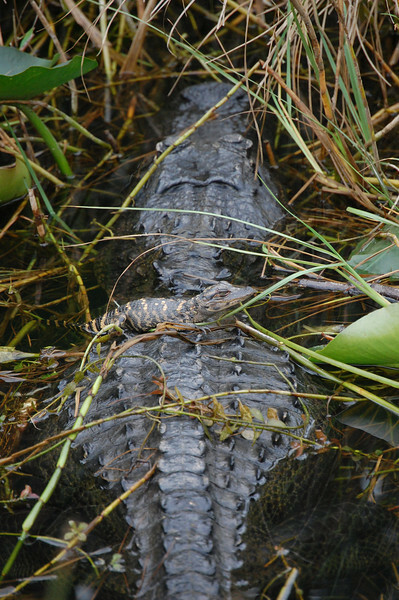 There is a $10 entrance fee per car at Shark Valley and that is good for entry into any of the Everglades entrances for seven days. Shark Valley consists of a 15-mile paved loop road which can be walked or biked. Also, you can take a two-hour tram tour with Shark Valley Tram Tours (currently $18.25 per person, $17.25 for seniors, $11.50 for children). Shark Valley Tram Tours also rents bikes. But today, we brought our own bikes. Here's a link to the "Bicycling at Shark Valley" brochure. 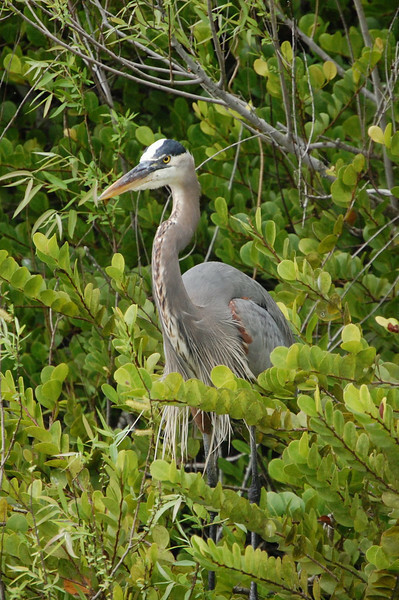 The road is a 7-mile straight shot along a mangrove-lined canal teeming with wildlife. 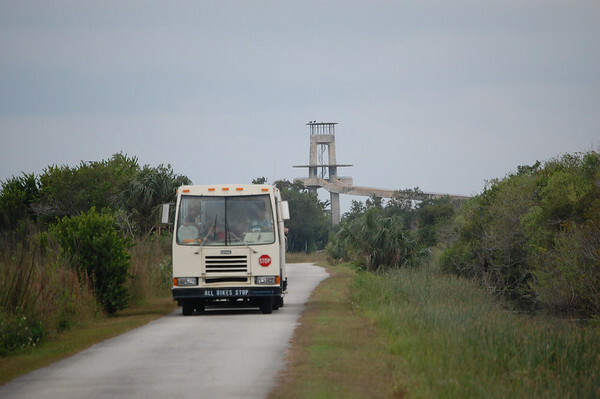 At the end of the road is an observation tower. Then the road winds 8 miles back to the visitor center through the "river of grass" most people think of when picturing the Everglades. There are a few hiking trails as well. 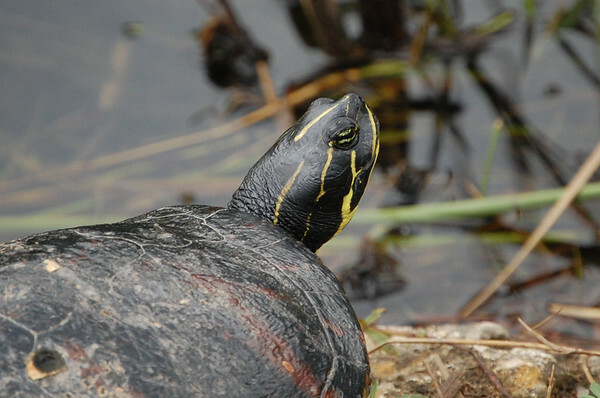 If you are not up for a bike ride or tram tour, a short walk down the "West" road will provide you with sightings of most of the wildlife you will see in the park. We had our lunch in the parking lot, and got the bikes off the rack for the day's tour. It was overcast all day, but that it made it nice for a 15-mile bike ride. Well, it was more like pedal for a few feet, stop, take a picture, ride a few more feet, stop, .... etc., etc. Okay, now you are in for lots of pictures. 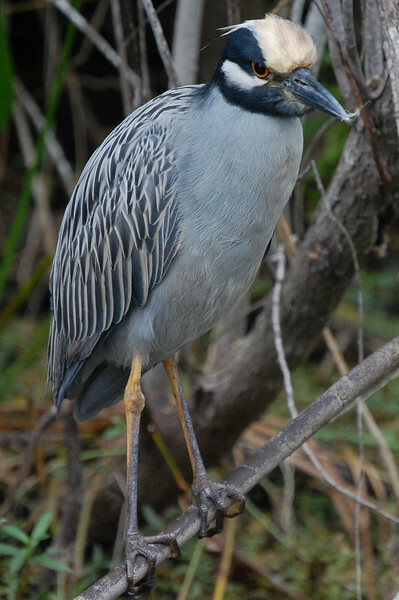 We'll start with this Yellow-crowned Night Heron. 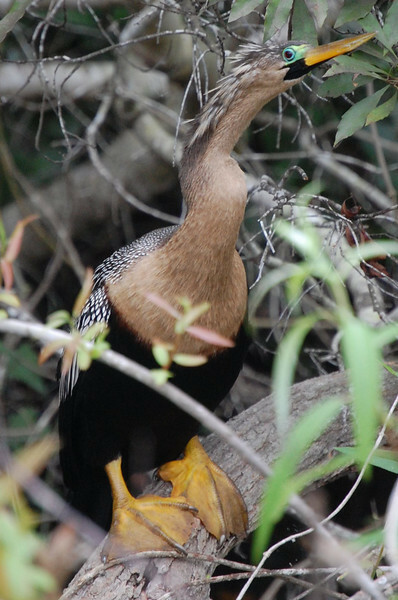 The Anhingas were probably the most common bird along the canal. Notice the ring around the eye. 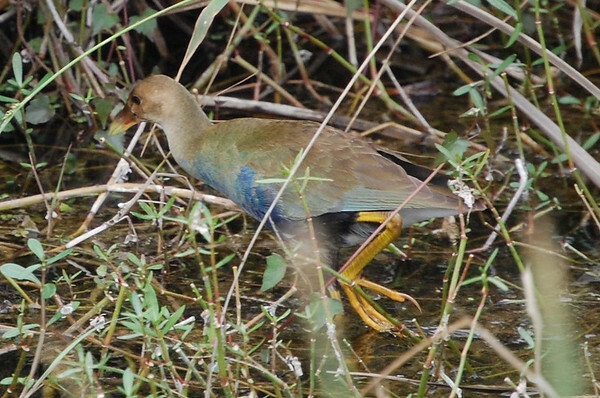 Although the literature calls it a "blue" ring that exists in breeding plumage, it looks green to me. 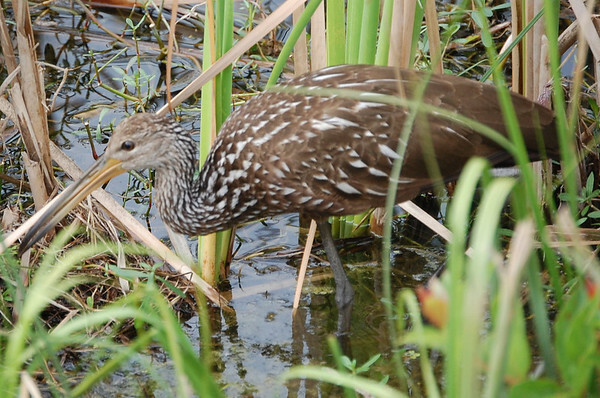 Next, we have a Limpkin. Linda spotted that one and it was a nice sighting as we haven't seen very many of those in our travels. Linda took a little video of it feeding. 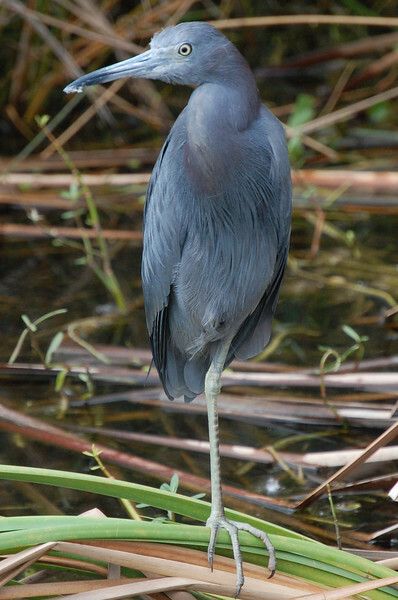 A lovely Little Blue Heron was next. 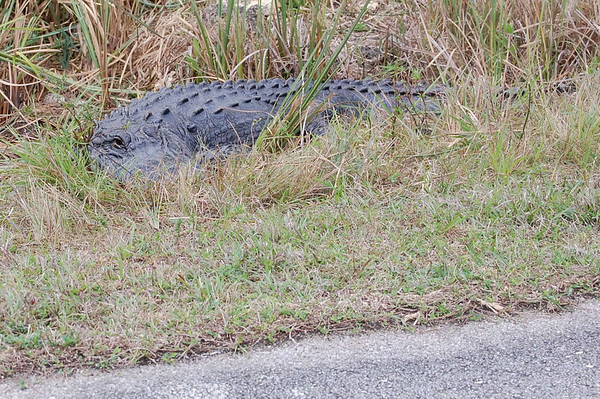 The park rules say to stay 10 - 15 feet away from wildlife, but many of the alligators were sunning right next to the road. 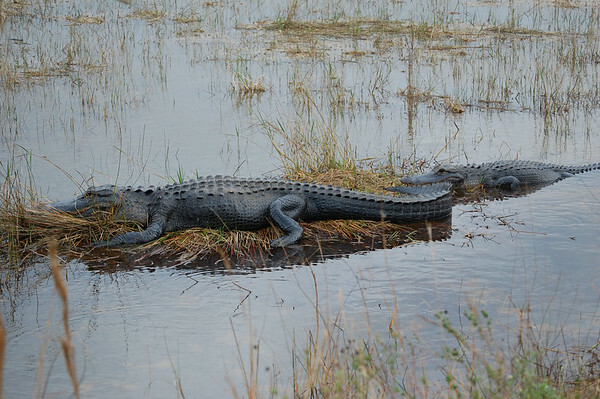 I've got more gator photos, but I think I showed great restraint today. 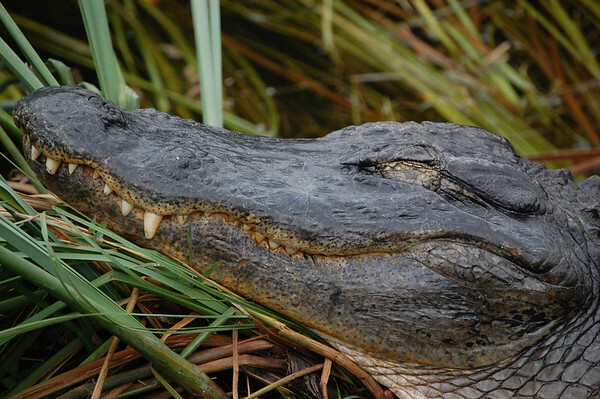 There's an alligator just about every 50 feet, maybe less. 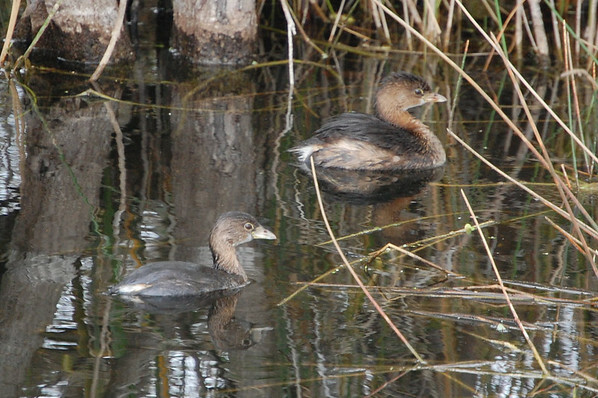 Here's a nice look at a pair of Pied-billed Grebes. There were quite a few turtles as well. 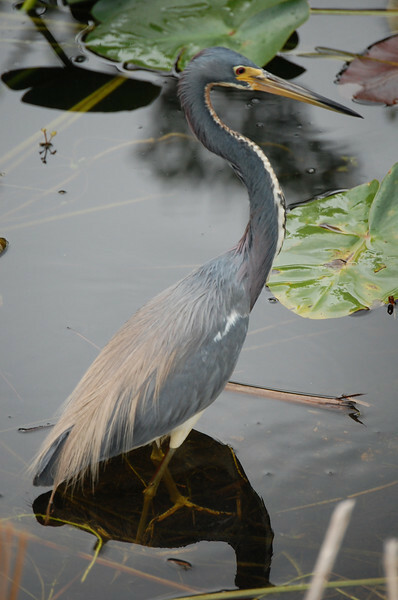 I'm throwing in this Great Blue Heron just 'cause I like the photo. Next, we got a "life bird". 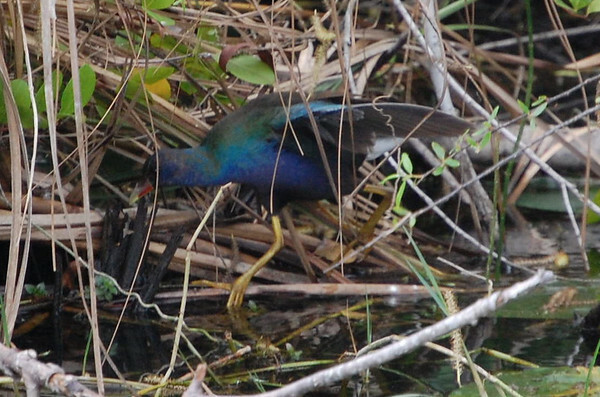 Our first in-person look at a Purple Gallinule. Linda got some video, but it was no match for my zoom lens. That was a juvenile, but later we saw a more colorful adult. Difficult to photograph, but very pretty, nonetheless. 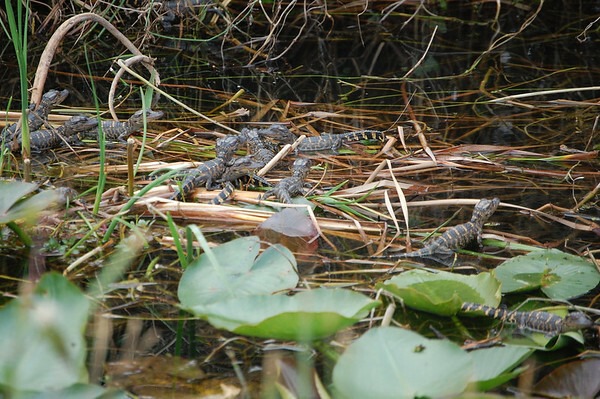 Alligators were abundant and there won't be a shortage anytime soon as baby gators were everywhere. Linda videoed the first batch we saw, but we should have waited as there were several more. Often they were on momma's back. But if momma wasn't around and a baby sensed danger, a few high-pitched grunts and momma would silently appear. 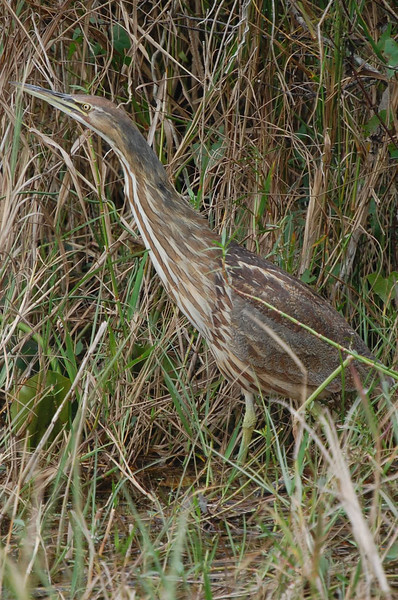 Next, I just happened to see this American Bittern. We saw two of those, and Linda did a little video of one of them showing how well they blend in. Surprisingly, this was the only photo of a Great Egret that I took. 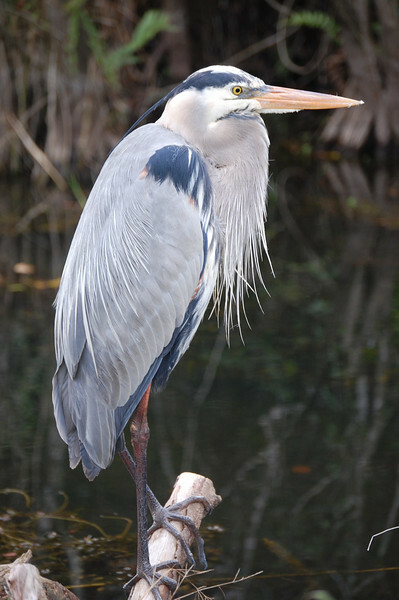 We've got tons of Great Blue Heron shots, but when they pose like this, it's hard to resist getting another one. 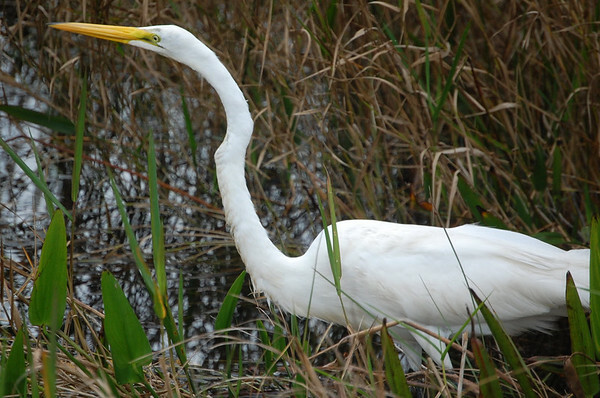 Great Egrets and Great Blue Herons are similar in size. 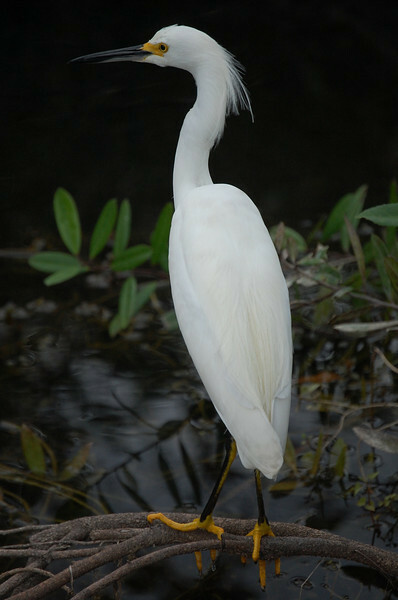 Next we have the beautiful Snowy Egret. Snowy Egrets, Little Blue Herons, and the Tri-colored Herons (next photo) are all similar in size and smaller than the Great Egrets and Great Blue Herons. 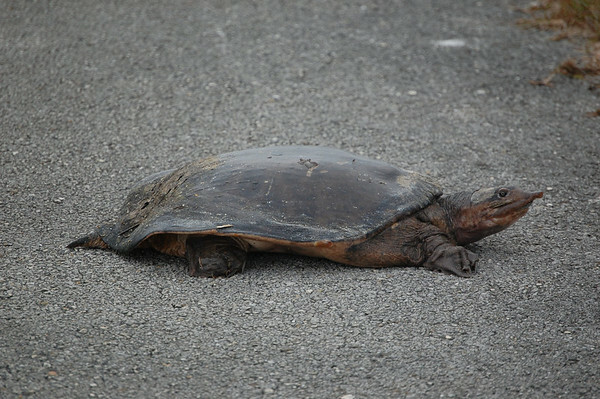 As we continued, this Florida Softshell Turtle crossed the road in front of us. 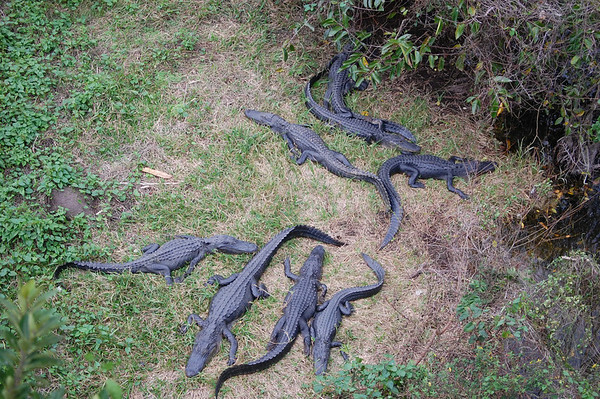 More gators on the opposite side of the road from the canal. 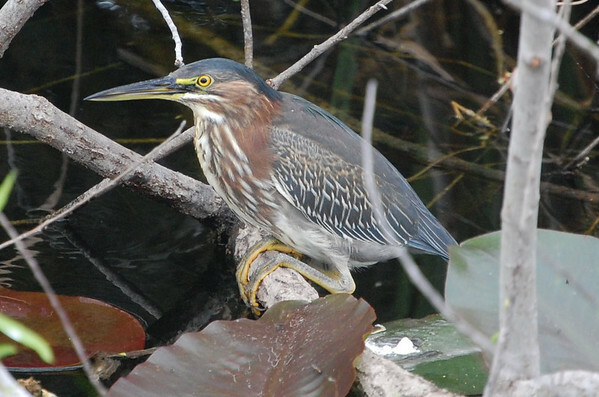 It took us quite a while to get a good view of a Green Heron, one of my favorites. 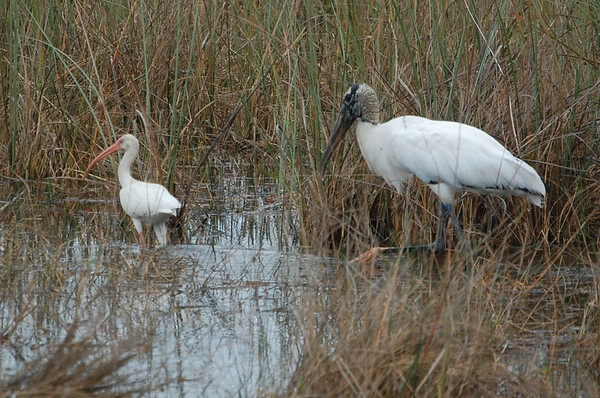 This Wood Stork and White Ibis seemed to be buddies. We watched as they followed each other around. The Wood Stork would use its pink foot to scratch in the muck and sort of chase food into its bill which would be placed in the water near its foot. Then the Ibis would come in behind and do a little probing where the stork had stirred things up. Much of the fun for us is watching all the different methods each species of bird uses to feed. It seemed like it took us forever to get to the end of the road. Of course, we stopped often for viewing and pictures. And we had to stop and move off the road every time a tram came through. Although not too many were following it, the rule was that bike traffic was supposed to go against the tram route, counter-clockwise on the road. And, as you can see, there isn't much room on the road and the tram would win every time. The tram makes several stops, but we were surprised how fast they went when they got moving. There was no way the passengers were able to see what we saw. We were glad we brought the bikes .... until a short while later. At the end of the West Road is an observation tower you can see in the above photo beyond the tram. We were getting close to the almost-halfway-point. 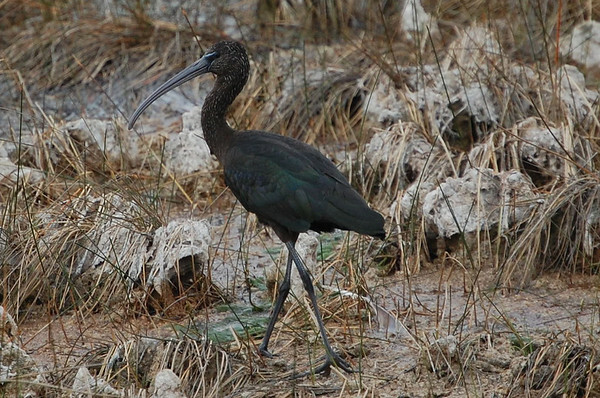 But there were still more birds to see, like this Glossy Ibis. It took me a couple miles to finally get a decent shot of one of those. 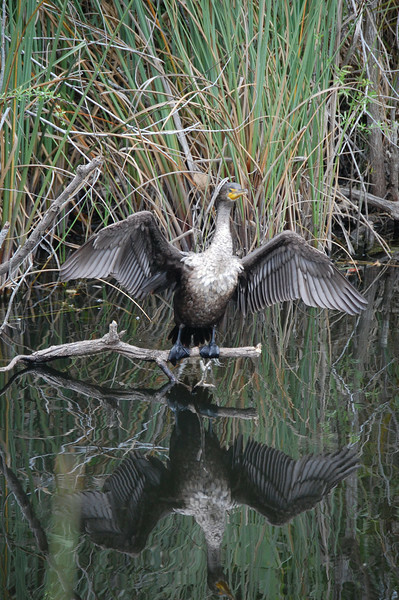 This Double-crested Cormorant was drying its wings just like the Anhingas do. 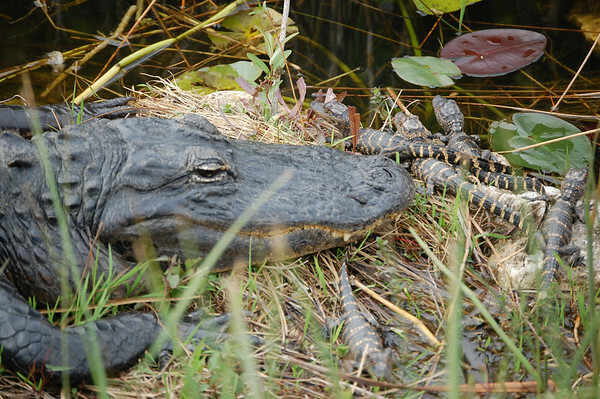 This big alligator was napping near the bike rack at the observation tower. and some serious rain clouds coming our way fast. It looked like it was going to take too long to wait it out, so we got back to our bikes and started flying the eight miles back to the visitors center and parking lot. We didn't get very far before we were soaked. Luckily, it was warm enough that we didn't freeze. And we carry a poncho in my camera bag. So we wrapped the camera bag in the poncho to keep all the equipment dry and just kept pedaling. I missed getting some good shots of Roseate Spoonbills, but other than that, we didn't miss much on that part of the road. There were lots more alligators and more of the birds we photographed above, at least the best we could see with rain dripping off our hats and our sunglasses not having windshield wipers. Pictures of us would have been pretty amusing, and we would have done it had it not been for the difficulty of getting the camera stuff untangled from the poncho. I think the folks on the tram might have gotten some good shots as they giggled going past. Oh well, another adventure. We might come back another day. We didn't do any of the walking trails, so if we have a day later in the week, it might be good to revisit. So, that's our second tour of Shark Valley, almost five years after our first visit. Hope you enjoyed it.